This is a version of croquet in which each turn consists of a single shot. The course is the same as for Association croquet, and players take turns in sequence, following the order of colours on the centre peg. T he first player to go through each hoop scores the point for that hoop. The next person to play then hits his or her ball towards the next hoop and play continues until one of the players goes through that hoop. If the scores are level after 12 hoops the players will contest the third hoop for a second time and whoever gets through this hoop first wins the match. Golf croquet used to be the poor relation, played mainly as an introduction to Association croquet. It is easy to learn and quick to play. It is also sociable as, unlike Association croquet, all the players are on the lawn at the same time. In recent years golf croquet has been actively promoted in its own right, and there are now many more tournaments and national club competitions. As a result it has become much more popular, and this has resulted in a healthy increase in membership for many clubs. 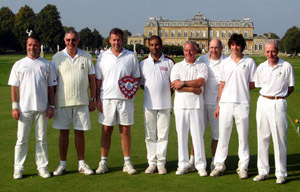 The Surbiton and Ashby teams after the golf croquet Inter Club final in 2008.